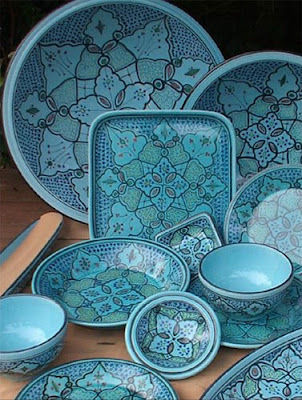 I found these gorgeous dishes online at Le Souk Ceramique. This is just one of about a dozen patterns they offer. The dishes are made and hand-painted in Tunisia and conform to all USA safety regulations. If you're looking for some new dishes, or even a serving piece or two, check out this site. They are also sold on amazon.com and I will definitely be adding a couple pieces to my amazon wish list! Oh, those are beautiful! Great choice. These dishes are gorgeous,I love them. Barbara- They are just so pretty. They're not crazy-expensive, but still not cheap. But, I think they are doable collected one or two pieces at a time. Check out JustDishesDinnerware blog - they are giving away a free 16 piece place setting of Le Souk dinnerware. Maybe they will exchange the pattern to the one you want. :) No harm in asking. Thank you so much for the tip about the give-away!!! !